After only two days on a sort of Daniel Fast (I've been failing miserably in my preparation for the real thing), I'm craving sugar. Really badly. All day I've been craving blueberry muffins. And dark chocolate. 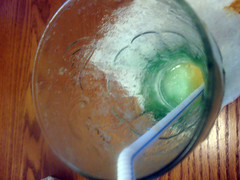 Which I guess is a good thing that I'm limiting myself with the sugar. This is showing me just how addictive sugar really is, and how much I need to stop indulging in it so often. But it's one of my guilty pleasures! 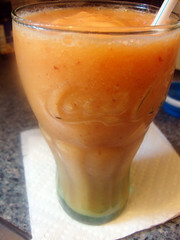 I had some leftover fruit that I threw in the freezer yesterday, so I decided to make a smoothie with it today. I like to call it the sunrise smoothie, because it's peachy color reminds me of the orange sky that a sunset brings with it. The plum peel leaves beautiful light red flecks all throughout the drink. Chop up all fruit into bite size pieces. Place in a plastic baggie and freeze until hardened. 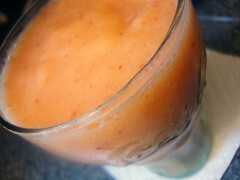 One frozen, place fruit, OJ, and water in a blender and blend until no pieces of fruit remain. Want to make me one sometime? 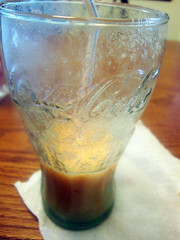 ;) the smoothie looked oh so yummy.